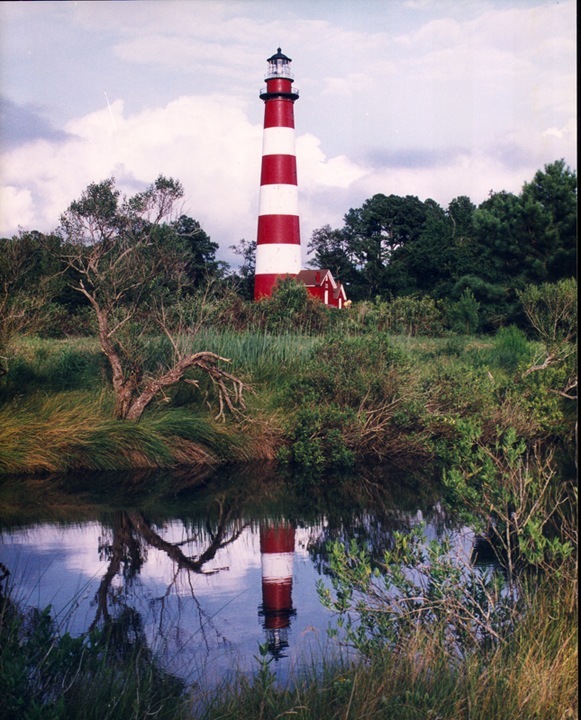 Did you enjoy learning a bit about the significance of a tiny little island and its impact on the Chesapeake region as well as the shellfish industry in general? What about my connection to "American Royalty"? 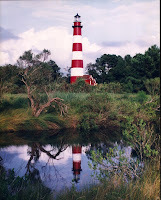 If you missed last month's post, you can view it here: http://www.hhhistory.com/2016/02/chincoteague-enchanted-island-in-ocean.html. Another famous and fascinating aspect of Chincoteague Island is connected to the "sister" island of Assateague just across the channel to the east. Pony Penning is an annual event held on the island of Chincoteague on the last consecutive Wednesday and Thursday in July. 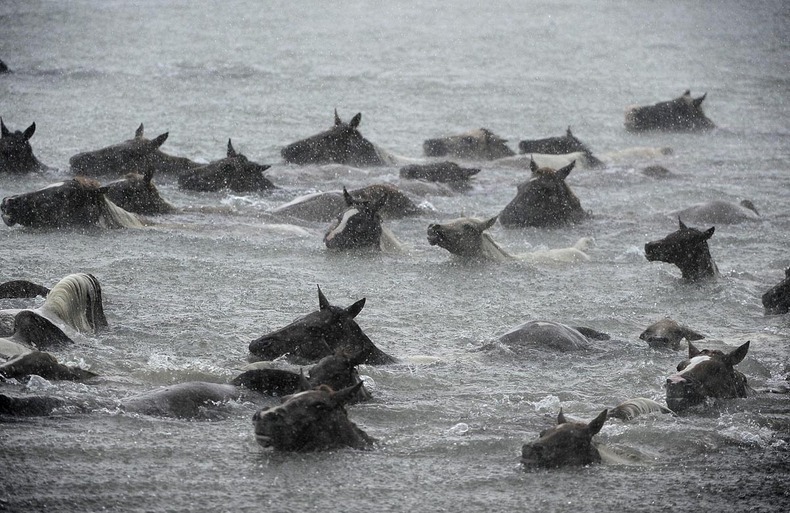 It consists of a Wild Pony Swim on Wednesday and a Pony Auction on Thursday. For the swim, "Saltwater Cowboys" (Fire Department volunteers) round up ponies from Assateague Island and drive them across the Assateague Channel to Veteran’s Memorial Park on Chincoteague Island. The ponies swim across the channel during what's known as slack tide. I had no idea what this was when I was researching details. Tides were either high or low when I heard them, but "slack" is when the water has minimal tidal movement. This makes sense, as the ponies are wild, and driving them across the channel needs to be a smooth experience. 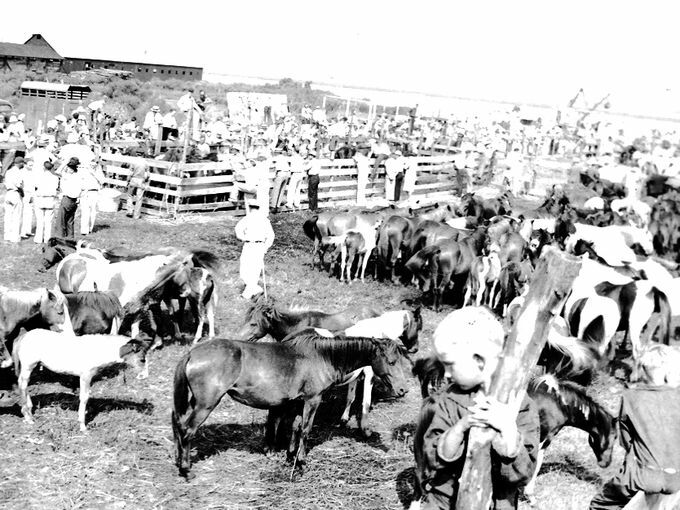 Once on Chincoteague, the "cowboys" drive the ponies through the heart of town and herd them into pens on the carnival grounds. Here, interested buyers can browse and observe the ponies in preparation for the auction on Thursday. The process is to thin the wild herd on Assateague to keep them healthy and thriving and sustainable at 150 ponies. lighthouse and walking around, always keeping an eye for an elusive wild pony. Growing up hearing the stories of these ponies fostered my love of horses which I still have today. Learning I actually had family ties to this island fascinated me even more. 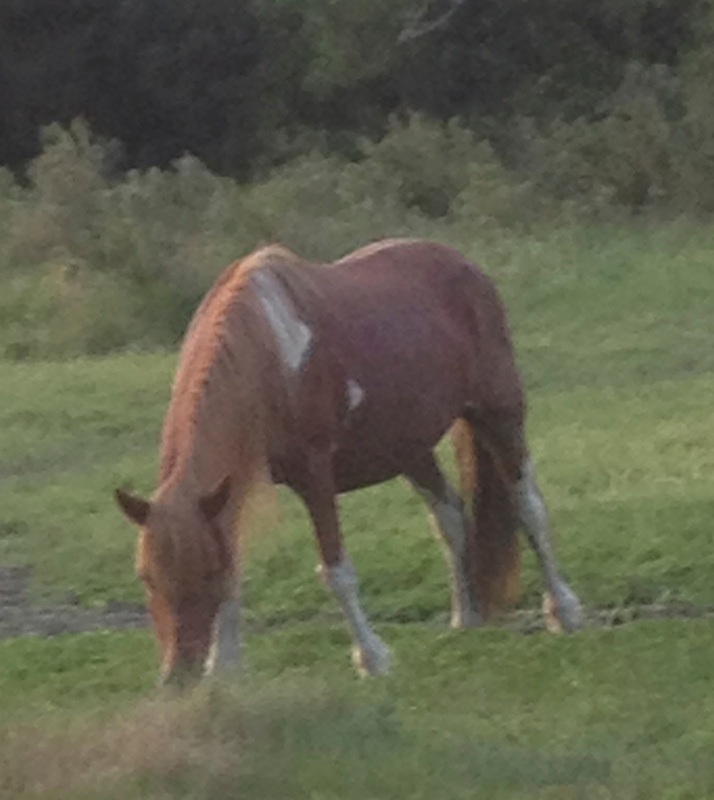 Though it took over an hour, I finally managed to see an Assateague Pony. Two years later, a friend came to visit, and together, we ventured onto the island during the week of Pony Penning. I had told her a lot of what I'm sharing in these posts each month, and she wanted to witness some of it for herself. If you ever get a chance to experience it firsthand, I highly recommend you take the time to go. The entire week of festivities is only a fun complement to the actual rounding up of the wild ponies, which is quite a sight to behold! This traditional event in its current form has taken place since 1925 to raise money for the volunteer fire department, but its roots date back to the 17th century, when the island was primarily used to house livestock owned by residents on the mainland. 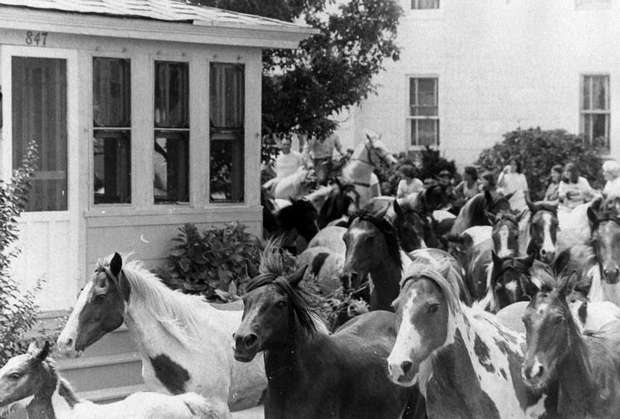 Wild ponies roamed free, but residents would go over to Assateague and build corrals for the local herds. 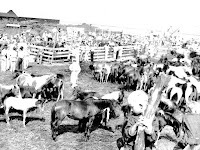 Selected horses were branded, gelded, and sold, a practice which lasted until the early 20th century. Once the fire department assumed control, it became a regular, annual event, combined with a fair and many other festivities. 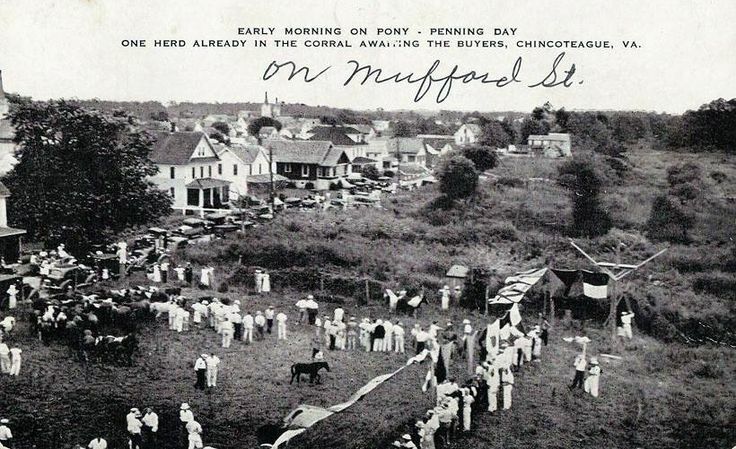 The event was made popular to thousands of readers and soon-to-be tourists by the book Misty of Chincoteague, written by Marguerite Henry and published in 1947. To the left is a postcard from around 1940, capturing the event. It now usually draws from 40,000 to 50,000 spectators during its week-long fair. We are approaching the official 100th year for this event, and I can only imagine what's in store for *that* year! In the meantime, if you are in the area and able to attend, check out the link below for details. * Have you ever attended the annual Pony Penning Day? When? Is this an event that might be on your "bucket list" of things to do? * What other event do you know where horses are the highlight and feature attraction? When and where does it take place? Does it draw large crowds? * Have you ever been around real wild horses or ponies? Where did you see them? How close did you get? 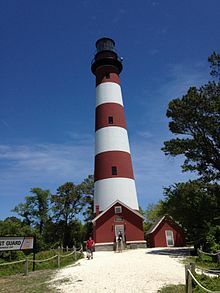 * Do you have a lighthouse near you, or is there one you've visited that has become your favorite? Where is it? What makes it unique? Leave answers to these questions or any comments on the post below. Next month, I'll be covering the BeeBee family and their ties to the island as well as the famous Misty of Chincoteague. Come back on the 9th of April to find out more. Very interesting! I grew up reading the Misty of Chinciteague! There are no lighthouses in Oklahoma. I remember reading Misty of Chincoteaque when I was a girl. Later, there was a movie made that I really enjoyed. I have always loved horses and would love to attend Pony Penning Day, but sadly, I don't see that happening any time soon. As for attending Pony Penning, it would definitely have to be a planned vacation, not something you do on a whim. Glad to help, Jeanie. And sometimes we do have to live vicariously through others' experiences. That's ok, though. 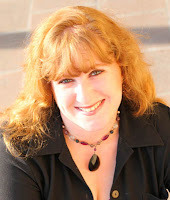 We can get some great insight and even lessons from stories like that. As for the books, so many from previous generations (i.e. older than 40) remember these books, but anyone younger doesn't have any idea. I'd say it's definitely time for a revisit to Chincoteague and a NEW set of pony stories, wouldn't you agree?